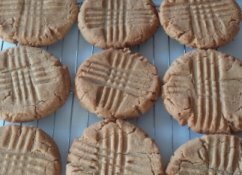 Jumbo Three Ingredient Peanut Butter Cookies are a super-sized variation of 3 Ingredient Peanut Butter Cookies, identical but for the size. Like its little sister, this recipe calls for a simple ration of ingredients: 1-1-1 for cups of peanut butter to cups of sugar to eggs. Plus with no flour in the recipe, they are gluten free. Since these are jumbo cookies, they take more cookie dough per cookie – about 2 -3 times more than the smaller twin. That’s why you bake them longer. The easiest way to make a batch of these evenly-sized jumbo cookies is to use a ¼ cup measuring cup to scoop each one. Check out the baking tips for ideas about how to prevent the cookie dough from sticking to the scoop when you measure out the cookies. You can double or triple the recipe to make more cookies. You can also reduce the recipe to make just 3-4 cookies, simply be keeping the 1-1-1 ratio of ingredients. Preheat oven to 350º F. Line baking sheets with parchment paper or silicone baking mats. In a medium bowl using an electric mixer on medium speed, cream peanut butter and sugar until light and fluffy. Beat in eggs. Press cookie dough into a ¼ cup measuring cup. Tap the cup with your hand to release the dough onto the cookie sheet. Place cookies 3 inches apart on the prepared baking sheets. 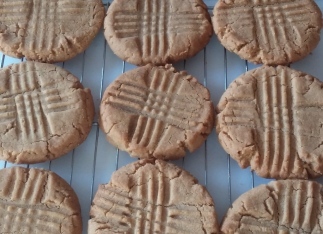 With a fork, press tines over peanut butter balls in a crosshatch pattern, one at a time, to flatten each cookie. Bake 15-18 minutes until cookies are lightly brown around the edges and appear to have no moisture peeking through crackled tops. Do not over bake. Cookies are best when they are still soft with bottoms that are barely light brown. Remove cookie trays from the oven. Allow cookies to sit for 5-10 minutes before using a spatula to transfer them to a wire rack. Let cookies cool completely. Wrap individual cookies in plastic wrap for cookie baskets or bake sales. Store remaining cookies in an airtight container. 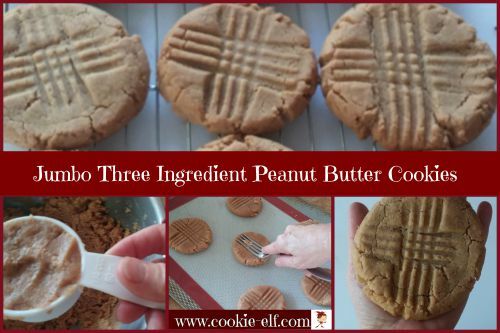 You can use either smooth or crunchy peanut butter in this recipe. Cookie dough is thick. Before pressing cookie dough into ¼ cup measure, spray the cup with vegetable spray. The dough will release from the cup more readily. Pull away cup edges from the pressed dough, turn the cup upside down into your hand, and tap the cup into your hand to release the dough. Respray the cup for each cookie. Giant Christmas Wreath Cookie recipe: beautiful for the holidays!